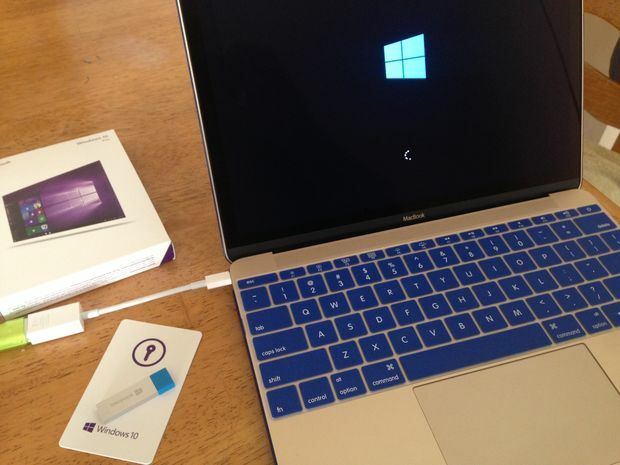 I was struggling to get Microsoft Windows 10 installed on the 2015 MacBooks that only have a USB Type C connector and thought I’d share how I was able to do it. – Purchase Windows 10 on USB flash drive from the Microsoft Store, Amazon or a local computer reseller. If you buy the Windows 10 Pro version it includes the installers for both the Pro and Home 64 bit versions. – Purchase Windows 10 as a download from the Microsoft Store or Amazon. You will still need to copy the .iso disc image to a 4GB or larger USB Flash Drive, and this step is best done from a Windows computer. I was unable to use Disk Utility or Boot Camp Assistant to properly create the Windows 10 USB Flash Drive from my OS X 10.10.4 Mac as of August 2015. If you purchased your copy of Windows 10 on a USB Flash Drive you can skip to this step. If you downloaded your copy of Windows 10 you’ll need to correctly copy it onto a USB Flash Drive. Unfortunately you can’t simply drag and drop the files because the USB Flash Drive needs to be formatted into a format that allows it to boot your Mac. You’ll need an empty 4GB or larger USB Flash Drive. Using a USB Flash Drive larger than 32 GB may result in the extra space being unused (Fat32 can only format up to 32GB). Your Mac needs to download Windows drivers for the various hardware components that Windows doesn’t include. You can have Bootcamp put these files onto your Windows 10 USB Flash Drive Install Disk you made or you can put them onto another USB Flash Drive (I would do this if you purchased your Windows 10 on a USB Flash Drive). You will install these after installing Windows 10 by using the installer in the Boot Camp folder. You will see a Boot Camp folder created on your USB Flash Drive. You can attach your Windows 10 USB Flash Drive installer to your MacBook and you should see the USB Flash Drive mount on your desktop and in your Finder. You Mac’s internal SSD drive is devoted to OS X. You’ll need to make room on your hard drive for Windows 10 which requires partitioning your drive. You can accomplish this by either using Disk Utility or Boot Camp Assistant. In either case you’ll default to a FAT32 style format for your Windows partition. If you prefer your Windows partition to be NTFS you’ll need to use allow Window 10’s installer to delete your FAT32 partition and create a new one (which will be NTFS). Using Bootcamp Assistant you would select Install Windows 8 or later version and when prompted with the disk partitioning window choose the size of your Windows 10 partition. In my case I gave Windows 10 100GB of my 500GB drive. I would not go less than 20GB if you want to have room to install Windows apps. If you want to use Disk Utility you would select your MacBook’s SSD drive, choose partition, choose the + icon at the bottom of the existing partition and then place your mouse pointer between the two partitions to resize. After partitioning you would invoke the Windows installer by restarting your Mac and holding the option key until you see the option to boot off your Windows 10 installer disk. Tip: Windows can make it confusing as to which partition it is installing onto. I would make sure I’ve backed up my MacBook and that I have not chosen then 50% partition split. By making one of the partitions larger than the other you can easily find the partition you are trying to install onto. NTFS Note: If you create a NTFS partition you’ll gain the advantage of read/write protection similar to Mac’s HFS+ Journal, but you’ll lose the ability to write to the NTFS volume from your Mac unless you buy a 3rd party NTFS driver from Paragon. ExFAT Note: While Macs can create ExFat partitions (ExFat=FAT64) that work well for transferring data between Macs and PCs, Windows can’t actually be booted from an ExFAT drive (so choose FAT). This part is fairly straight forward (thank goodness)! You may have to squint to see the installer options given your MacBook’s high resolution retina screen. Select your install options. Windows 10 64 bit home or pro version. The biggest difference is the pricing for a product key with Pro giving you Bit Locker encryption, virtualization, remote desktop and workgroup policy settings. You’ll then be prompted to enter your product key. If you bought the USB Flash drive version the key is a sticker on the back of the credit card in the box. If you bought the download version then your key is in your receipt. If you are using the free downloaded version you’ll need to hit the DO THIS LATER button when asked for a product key serial number. If you already have Windows 8 or 7 installed it shouldn’t ask you for a product key and if you activate by July 2016 it should be a free purchase. Windows 10 asks you to choose your settings. I chose Express Settings. Choosing Customize Settings gives you the option of turning off personalization, sending data to Microsoft, letting apps use your advertising ID and letting apps ask for your location. Create an account for this PC will ask you to enter a Username and password to access Windows 10. You could use the same login and password as your Mac login, but given the historic security issues around Windows I would be cautious about using your Apple ID which is most likely tied to your credit card. If you used Boot Camp Assistant to copy the Windows drivers to the same USB Flash Drive as the Windows 10 installer you’ll find that the Boot Camp Installer is automatically launched after installing Windows 10. If not you can launch the Bootcamp Installer by going into USB Flash drive, BootCamp folder and launching setup. After installing the drivers you’ll need to click Finish. Choose No on the prompt to restart. In the lower left corner of your screen choose the Windows Logo Start Menu. Choose Power and then choose Shut down. Disconnect your USB C to USB Adapter and attached Flash drive. Turn on your Mac. Be sure to hold the option key during boot up and select Windows instead of Macintosh HD. Verify you are able to login to Windows 10 by clicking the center of the screen and typing your password under your username. You are probably getting tired of squinting to read the dialog windows so go ahead and change the text display size by going to the Windows 10 start menu (lower left corner), select Settings, choose System, choose Display and moving the size slider from 100% to something easier to view (in my case 175%). Choose Apply and select sign out later. Goto the Windows 10 start menu (lower left corner), select Settings, choose Network & Internet, and select your wireless router. You’ll be prompted if you want your PC to be discoverable. With network access setup you can now run updates! Go to the Windows 10 start menu (lower left corner), select Settings, choose Update & Security, select Windows Update and download the latest updates. 1 – Run a backup since Time Machine doesn’t back up your Window’s partition. You can use the USB C to USB adapter to connect a Windows formatted USB 3 Hard Drive. 2 – Be sure to keep Windows Defender on until you install a virus protection program. 3 – Active Windows – Activation of your product key ensures that it is registered. If you chose to skip entering a Windows 10 product key you’ll need to buy one form the Microsoft store. If you installed Windows 10 on top of Windows 8 you should activate Windows 10 during the free upgrade period to avoid having to buy a key later. Congrats you are now up and running on Windows 10!